Calling all groups! Bachelor and bachelorettes! Teams and clubs! Schools, classes, and charitable organizations! Ctrl V is hands-down, the best place to congregate and celebrate how awesome you are. Because, let’s face it -if you’re playing VR together, “awesome” is an understatement. * plus TAX. Includes 14 VR Stations for one hour. Pricing is automatically applied when you add all VR stations in a time slot to your cart. Everyone knows the difference between a good company and a great company is a happy and productive staff. 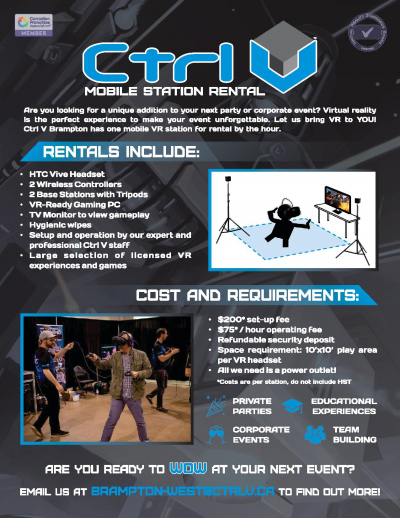 So keep your team happy and increase productivity by rewarding them with some sweet VR time at Ctrl V.
Take them to worlds that they have never experienced before with mind-bending interactions and immersive visuals that make them feel like they are on vacation. What a great deal right? Our VR experiences are perfect for team building and corporate culture design. With games varying from puzzles to zombie shooting mayhem, your staff will be talking about it for weeks. A minimum of two hours is required for any groups interested in having their event include food or alcohol. Are you looking for a VR experience at your next convention, next meetup or next wedding (or your first wedding)? Ctrl V has your solution. Our mobile team will come to your event with all of the gear needed and staff to help your group have the best experience possible. Let us know ahead of time specifically what you’re looking for and we’ll do our best to try and accommodate to make your event one to remember.